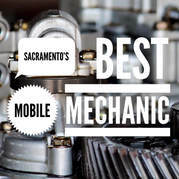 In today’s world, having the affordable convenience North Highlands Mobile Auto Repair, in North Highlands​, CA can provide you can save you time and money. Our North Highlands based technicians come to where your vehicle needs serviced, and in most cases performed it on-site. You do not need to pay an expensive tow bill, or risk causing more damage to your car by driving it. Simply give us a call and a technician will arrive at your door. North Highlands Mobile Auto Repair is a team made up of local experienced technicians dedicated to carrying out high-quality auto repairs. When you can't bring your vehicle to the shop to get repaired, we bring the repairs to your vehicle. Due to the lack of overhead costs, we do repairs at a fraction of the price that a shop would charge, and at twice the convenience. Aside from quality auto repair, our number one goal is customer satisfaction. Similar to the repairs we do, we don't cut corners when it comes to the parts we use either. We only use high quality and durable parts so you can stay worry-free knowing that your auto repair will last. While many people think that an onsite car service will cost more than a shop, we lack many of the overhead costs that auto repair shops pay and therefore we can charge a much more affordable price. You will not be frustrated, if you call us at North Highlands Mobile Mechanic 916-306-5254. We try our level best to make our customers happy!